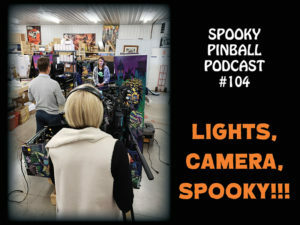 While it may be November 1st, it’s still Halloween here at Spooky Pinball every day! Bug & Charlie go over a quick list of their favorite spooky theme games… while we hear from Ryan (aka the Night Mutilator) about the 6th annual “Hauntcade” Horrorhouse Fest, held this year at the Hyperspace Arcade. Danni is back to tell you how to defeat the invincible Iron Man game, as of course the E.M. Dungeon will show you the path of vintage games is a manageable one. Toss in a super cool Alice Cooper custom PinGulp from the fine folks at Pinball Life, and it’s all treats with only a few tricks. Have fun ghosts & goblins!